We had six bruising battles in the second round. From twelve contestants, we are now down to four. In these battles, IIFT Delhi and Team Lucy ….. from IIM Trichy continued their excellent performance. 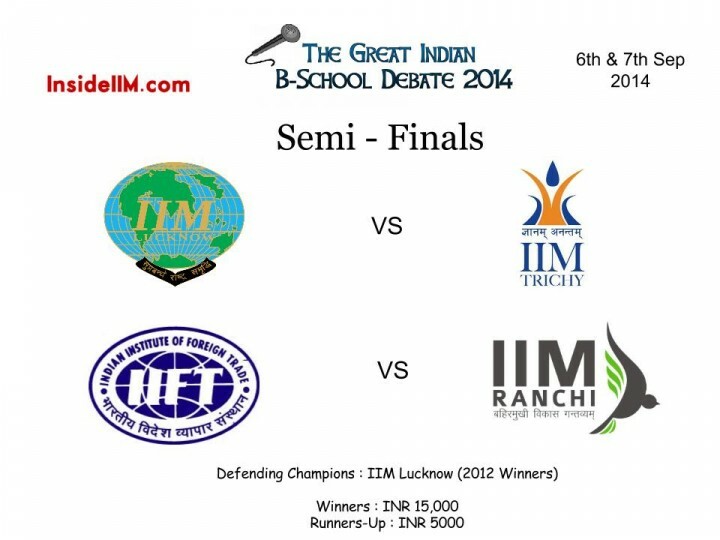 IIM Ranchi and IIM Lucknow were the other two teams that made it to the semi-finals. XLRI Jamshedpur, VGSoM IIT Kharagpur and MDI Gurgaon missed out narrowly on a place in the final four. One thing unites all four semi-finalists – they took the logically most direct approach to proving their arguments, and demolishing those of their opponents. The Semi-Final lineup has a couple of mouth-watering match-ups. The semi-finals will be a Live Debate. Once the opening arguments are uploaded, both teams will have an eight hour window to attack each other’s arguments and defend their own, using the comments section of the post. Comments will be considered valid only if they are made through the InsideIIM account for debate. The audience is also encouraged to participate. Frivolous audience comments will be deleted immediately. The semi-finals will be held on 6th and 7th September.